Helps your dog endure any daily activity by providing the nutrition he needs for sustained energy, muscle function and mental focus. The supplemental Xtreme pack in CanineX™ provides a revolutionary compound of Antarctic krill meal and L-carnitine, a powerful support for building and maintaining lean muscle mass, proper brain function and a healthy immune system. Your dog will enjoy the blend of proteins from beef meal, krill meal and egg. 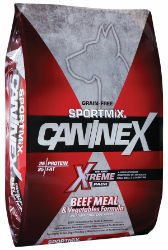 SPORTMiX® CanineX™ is 100% guaranteed for taste and nutrition. Made without corn, wheat, soy or by-products, CanineX™ is an excellent grain & gluten-free alternative diet for any active dog. This antioxidant recipe is enriched with vitamin E and vitamin C, along with glucosamine and chondroitin sulfate, for proper development and function of bones and joints. Fibers from nutrient-rich vegetables and fruits, such as peas, apples, blueberries, carrots, spinach and cranberries help overall digestion. Fortified with balanced Omega-6 & Omega-3 fatty acids, CanineX™ helps support healthy vision, skin and hair coat. A standard 8 oz. measuring cup holds approximately 3.9 ounces of SPORTMiX® CanineX™ + 1/2 cup per 10 lbs. body weight Beef Meal & Vegetables Formula. Have clean fresh water available at all times. Beef Meal, Peas, Chicken Fat (Preserved with Mixed Tocopherols), Pea Protein, Pea Starch, Flaxseed, Dried Beet Pulp, Krill Meal, Natural Flavor, Dried Egg Product, Brewer’s Dried Yeast, Apples, Blueberries, Carrots, Spinach, Cranberries, Potassium Chloride, Salt, Choline Chloride, DL-Methionine, L-Lysine, Taurine, L-Carnitine, Glucosamine Hydrochloride, Chondroitin Sulfate, Yucca Schidigera Extract, Beta-Carotene, Mixed Tocopherols (preservative), Rosemary Extract, Green Tea Extract, Vitamin A Supplement, Vitamin D3 Supplement, Vitamin E Supplement, Zinc Sulfate, L-Ascorbyl-2-Polyphosphate (Source of Vitamin C), Ferrous Sulfate, Niacin, Calcium Pantothenate, Riboflavin Supplement, Copper Sulfate, Pyridoxine Hydrochloride, Thiamine Mononitrate, Manganese Sulfate, Zinc Proteinate, Manganese Proteinate, Copper Proteinate, Calcium Iodate, Cobalt carbonate, Folic Acid, Sodium Selenite, Biotin, Vitamin B12 Supplement, Dried Enterococcus Faecium Fermentation Product, Dried Lactobacillus Casei Fermentation Product, Dried Lactobacillus Acidophilus Fermentation Product. SPORTMiX® CanineX™ Beef Meal & Vegetables Formula is formulated to meet the nutritional levels established by the AAFCO Dog Food Nutrient Profiles for maintenance.